We had such a fun day on Thursday finishing out the beginning stages of our little garden. This is my first garden and I'm so thrilled. I remember growing up harvesting veggies out of my grandmother's garden every sunday after church, so this brings back some fun memories. While I was in Biloxi with our youth group, my mom worked her tail off getting the boys to do some planting. I came home to 3 excited boys just beaming with excitement about their flowers and veggies. They planted 2 tomato plants, 3 pepper plants and about 5 broccolli plants. She had also gotten some seeds to sow. That was our job this week. 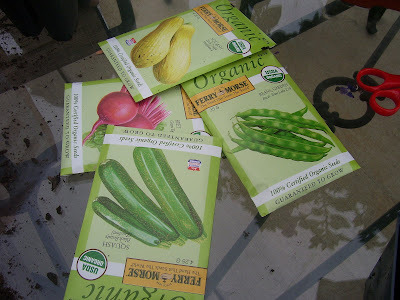 We sowed squash, zucchini, beans, beets and more tomatoes into little trays and will later transport them. While we were working, getting dirty in the soil, and talking the conversation of sowing and reaping came up. It was just perfect timing for me and the boys. Earlier this week I had asked a friend for some Godly wisdom with training my oldest. During our conversation she stated, ultimately we are to teach them that they reap what they sow...in all areas of their life. So, this thought resonated in me while I was outside with the boys. So, not only did we talk about sowing and reaping with gardening, but also our actions, words, truthfulness, and other core issues. 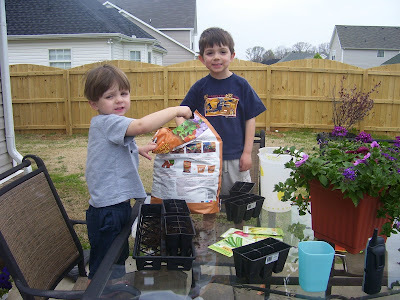 Now, I am hopeful of this gardening thing, but I have more faith that God is planting more than I could ever dream of in my heart and the boys' hearts. My prayer is that we all would be mindful of our "sowing and reaping" as we go through our day. I love reading into your lives. I only wish I were living right next to you to see it with my eyes. 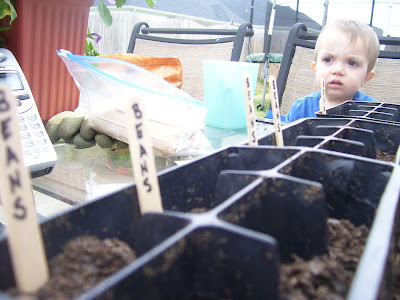 You are such a sweet mom to include the kids in the gardening process and train them up in the Lord at the same time. I can't wait to hear about how things grow in that Tennessee soil. hey girlie. what a sweet post. ross and i have been dreaming of a garden lately but i'm not so sure much grows in the hard ground of az. are you still heading this way? we would love to come up and see you if you have time. let me know. diddo on the happy bday! !